Virendra Singh, a 48-year-old farmer from Barabanki district of Uttar Pradesh, is a proud father. His son, Sandeep, recently completed his Masters degree, an impressive achievement for a family that has never been to college before. Singh dreams of asking his son to join the family profession, but falling income from their farms may force Sandeep to look for other sources of livelihood. A farmer of traditional crops such as paddy, black gram and peanuts, Singh started growing Mentha (Mentha arvensis, a species of mint) in 2005 after the demand for its oil began to soar in the mid-1990s. Mentha oil is used to manufacture menthol, a “cooling” ingredient used widely in food, oral care, pharmaceutical and cosmetic products. The crop brought Singh instant success. 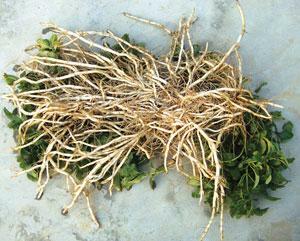 “After I started growing Mentha, my income increased about 150 per cent. My economic condition improved and I was able to send my son to Rae Bareilly to do his Masters,” he says. But this financial safety net of farmers is losing out to its artificial substitute. Synthetic menthol has flooded the market, selling at US $13 per kg internationally against $16 per kg for the natural version, making it the preferred input for consumer goods companies. In India, synthetic menthol has caused prices of natural mentha oil to plunge from around Rs 1,200 per kg in 2010 to Rs 850 per kg in 2016. This has made Mentha farming unsustainable. “Everything has become costlier, whether it is labour, fertilisers or pesticides. But the price of Mentha is falling and my income has become negligible,” Singh says. Synthetic menthol is derived from different chemicals produced as a result of synthesis processes (see ‘What is synthetic menthol?’). While NATURAL menthol is obtained from the plant Mentha arvensis, synthetic menthol is the result of a chemical process. In 2004, Germany-based chemical company BASF started a new process plant for the synthesis of citrals which are naturally occurring components of essential oils. Citrals are passed through a process called asymmetric hydrogenation which yields a number of chemicals. One of these chemicals is used to produce synthetic menthol. It is a continuous process and one of the residues can be recycled to produce more synthetic menthol. This menthol is at least 99.7 per cent pure. It is being manufactured since the 1970s by flavour- and fragrance-producing companies such as Symrise and Takasago. But German chemical giant BASF shook up the market in 2012 when it launched the world’s largest menthol-producing facility at its mega chemical plant in Ludwigshafen, Germany. Production of synthetic menthol increased 150 per cent, from around 5,000 tonnes before BASF’s entry to 12,500 tonnes currently. The International Trade Centre, an agency of the World Trade Organization and the United Nations, estimates that the global production of synthetic menthol is estimated to rise to 15,000-20,000 tonnes per year in 2017. Both BASF and Symrise plan to expand their menthol production capacities and Symrise admits that mass production of synthetic menthol has cost advantages over producing the natural variety. This abundant and cheaper synthetic menthol now threatens to displace India’s position as the world’s largest producer and exporter of natural menthol. Production of mentha oil in the country tanked 40 per cent from 48,000 tonnes in 2014-15 to around 29,000 tonnes in 2015-16. The area under Mentha cultivation has also fallen from 300,000 hectares (ha) in 2012 to 250,000 ha today. According to Spices Board India, under the Union Ministry of Commerce and Industry, the country’s exports of mint products have dropped 17.9 per cent year-on-year in 2015-16. Similarly, revenues from exports of mint products have registered a 34.6 per cent decline since 2012-13. It is difficult to calculate how much synthetic menthol is imported because government data does not distinguish between natural and synthetic menthol. Data from the Director General Of Commercial Intelligence and Statistics shows that the country imported 868.87 tonnes of menthol in 2015, while industry body Essential Oil Association of India states that India imports 800-1,000 tonnes of synthetic menthol per year. Germany is the largest supplier of menthol to India. It is also difficult to trace the end users of the imported synthetic menthol. Devvrat Sharma, spokesperson for Mint Growers Association, says that according to industry insiders, many consumer products such as oral care items use the synthetic variety. Down To Earth wrote to many oral care and cosmetics companies such as Patanjali, Colgate-Palmolive and Emami, asking if they used synthetic menthol. But none of the companies had responded to the query till the magazine went to press. Provisions under both The Drugs and Cosmetics Rules, 1945, and the Bureau of Indian Standards do not provide clarity on whether companies must disclose they are using synthetic menthol on their labels. The rise of synthetic menthol is likely to affect more than 400,000 families that grow Mentha. More than 80 per cent of the country’s natural mentha oil is produced in Uttar Pradesh, followed by Punjab, Bihar, West Bengal and parts of Uttarakhand and Madhya Pradesh. Natural menthol-producing companies also fear the advent of foreign chemical giants. “The day their new factories start operations, it will be the end of the business of natural menthol,” says Arvind Nanda, owner of Mentha and Allied Products Ltd, a natural menthol company. Farmers demand policy interventions, such as the imposition of an environment tax on synthetic menthol to dissuade its import and encourage natural menthol production. 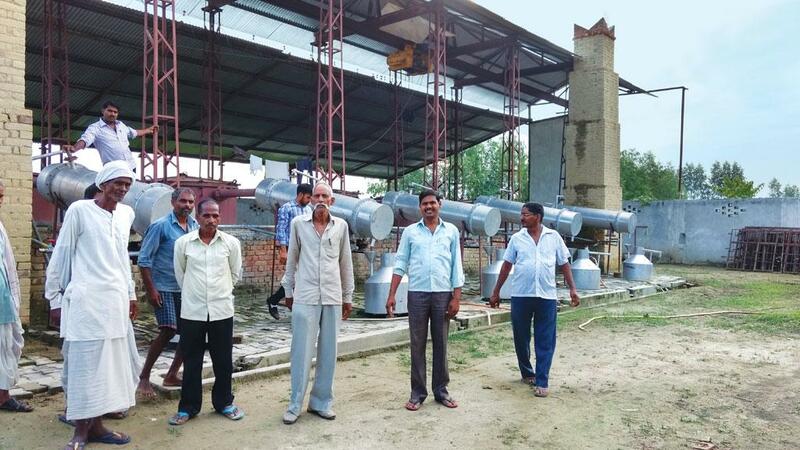 “Financial assistance to farmers for installing distillation units and buy-back support for mentha oil will go a long way in helping farmers compete with synthetic menthol,” says Anil K Tripathi, director of Lucknow-based Central Institute of Medicinal and Aromatic Plants (CIMAP). To protect domestic farmers and industry, CIMAP has developed two high-yielding varieties of Mentha that can grow in both summer and winter without any additional input. It has also developed the “Early Mint Technology” to increase per unit productivity of Mentha at a lower cost. The Council of Scientific and Industrial Research has launched the Aroma and Phyto-Pharmaceutical Mission to boost the cultivation, processing and marketing of aromatic crops such as Mentha. But activities under the mission and CIMAP’s innovations will begin to deliver results only after a few years. Till then, Mentha farmers such as Singh and Sharma can only hope synthetic menthol does not wipe them out completely. The story has been published in the 1-15 November, 2016 edition of Down To Earth magazine.